Seals are aquatic mammals which belong to the family ‘Pinnipedia’ which means ‘winged-feet’ and refers to their flippers, which are specially adapted for life in the sea. There are 33 species of seal worldwide, two of which live around the British coastlines. The Common seal (also known as the Harbour Seal) and the Grey Seal are the two species found in the United Kingdom. The British population of the Grey Seal is two thirds of the worlds population. 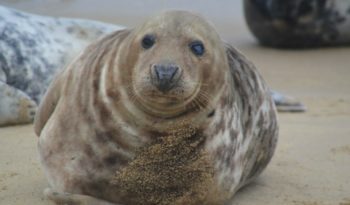 Seals can be found off the Scottish Isles, around the coast in Cornwall and the Scilly Isles and also off the Pembrokeshire coastline in South Wales. Seals also thrive around the Farne Islands and off the west and and north coasts of Ireland. 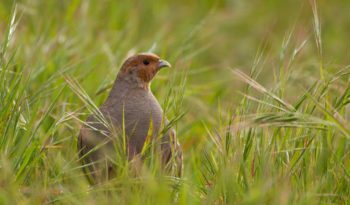 If you have ever visited one of the above places in the United Kingdom you might have seen them, like I had the pleasure in Cornwall, observing them closely flapping around curiously on the beach or playing in the shallow waters. Scotland in particular, is an important breeding area for Grey Seals. You can tell a Grey seal from a Common seal by their size. 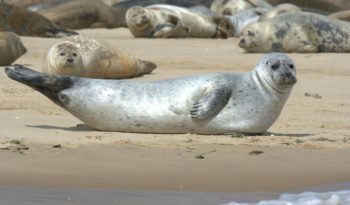 Grey seals are larger than Common seals and males tend to have a more uniformed colour. Seals are very timid creatures, but like all wild animals, will nip if they feel threatened, so it is wise to approach them gently, calmly and carefully. Other Seal species, including the Grey and Common Seals, live all over the world from the frozen wastes of the polar regions, to the tropical beaches in Hawaii and almost everywhere in between. Like all mammals, seals are warm-blooded and suckle their young just like humans. 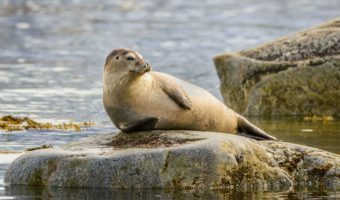 Millions of years ago, the ancestors of seals moved from the land back into the sea and evolved special characteristics to adapt to their environment. Seals appear very clumsy on land, but beneath the waves, they swim with elegance. 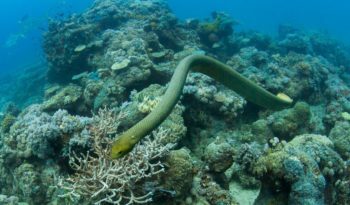 Their tornado shaped bodies allow them to glide gracefully through the water. Seals are skilled hunters of fish and other marine prey. Seals have flippers instead of hands and feet and they can dive for up to an hour to depths of more than 200 metres and even down to 500 metres without surfacing for breath. 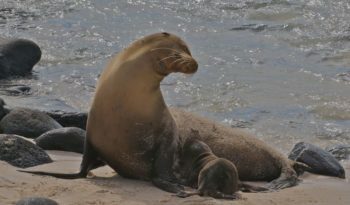 Seals are different from their aquatic cousins, the Fur Seal and Sea lions in a number of ways. The most prominent difference being Fur Seals and Sea lions can walk about on all fours, seals can only wriggle on their stomachs. 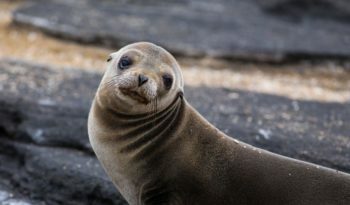 Fur seals and Sea lions also have ears, where as ears on a seal are so small that they can only be seen when they are wet. The largest member of the Pinniped family is the Elephant Seal, the males of this species can grow to be 13 – 16 feet long. The smallest member is the Baikal Seal which grows to be just 3 – 4 feet long. Male seals are called ‘Bulls’. Female seals are called ‘Cows’. Baby seals are called ‘Pups’. If a seal survives the dangers of being a pup, seals are generally long-lived animals. Both the Grey and Common seal have been known to live more than 30 years. One female Grey seal around the Shetland Isles in Scotland was known to be 46 years old. However, many seals do die at sea through pollution, parasitic diseases and being caught up in fishing nets.